Acer is trying to push down the prices of Chromebooks, announcing a new laptop with Chrome OS priced at US$199.99. The Acer Chromebook C720-2848 has an 11.6-inch screen, and is targeted at those who do most of their computing on the Web. The lightweight laptop offers 8.5 hours of battery life and runs on an Intel Celeron processor based on the Haswell microarchitecture. A new wave of Chromebooks, running the latest version of Chrome OS, have hit the market starting in October. The latest Chromebooks are priced above $200, and the new Acer laptop and could spark a price war. The low price will hopefully make Chromebooks attractive to more buyers, an Acer spokeswoman said in an email. Most laptops today have Windows. A Chromebook C720-2848 competitor will be Hewlett-Packard and Google's Chromebook 11, which provides 6.5 hours of battery and is priced at $279. The Chromebook 11 was announced last month and runs on an ARM-based Samsung Exynos processor. Acer last month announced the $249.99 Chromebook C720-2800, which has similar specifications to the newest Chromebook, but more DDR3 DRAM. 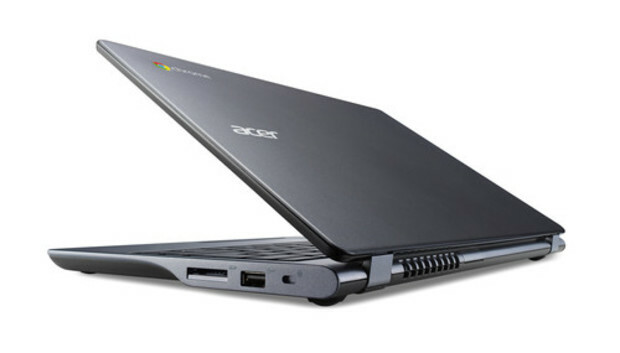 The Chromebook C720-2848 weighs only 1.25 kilograms, is extremely thin, and boots up in a matter of seconds, Acer said. It has 16GB of solid-state drive storage and 2GB of DRAM, with 100GB of free Google Drive online storage for the first two years. The screen can display images at a resolution of 1366 x 768-pixel resolution. Other features include a webcam, 802.11 a/b/g/n Wi-Fi, and USB 3.0 and USB 2.0 ports. An HDMI port allows the laptop to be connected to high-definition TVs. The laptop is available immediately in the U.S. Information on worldwide availability was not immediately available.